And we’re so happy to be working with the most perfect sponsor for a summer party theme feature: Carvel and ILoveIceCreamCakes.com. Because hello, ice cream cakes! Visit the site to find all the delicious ice cream cakes available right in your grocery store freezer, so you can grab your cake while you’re doing the rest of your party food shopping and save all that time and energy. Plus when you sign up for the Crunchie Club at ILoveIceCreamCakes.com you’ll get a $5 coupon to use on your next purchase, which means more money for presents! So, read on for lots of fun ideas, and get ready to party in style this summer. Even if the closest body of water is the kiddie pool, an under-the-sea party makes perfect sense on a summer’s day. Laura from Make Life Lovely has so many great ideas on her site, like using some ocean-hued table coverings and lots of shells, sand, and other beachy items scattered on the table. 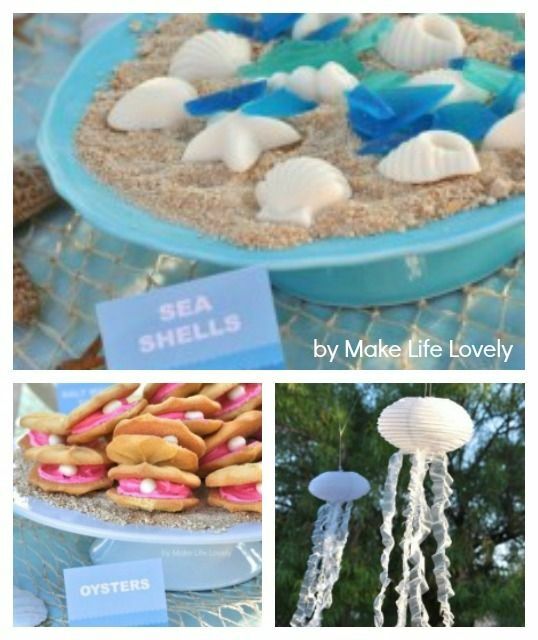 Add a few easy DIY “jellyfish” hanging from the trees around the yard which look awesome gently blowing in the breeze. We also love her “oyster” cookies, incredibly realistic sea glass candy, chocolate candy shells, and homemade faux-seaweed popcorn which add to the theme. And the sandy topping on her beautiful cake is something we could all easily recreate with a store-bought round ice cream cake, graham crackers, and candy seashells. For party games, we say: Go with anything involving water! Invite kids into the pool or even a kiddie pool in the backyard. Set up the sprinkler (away from the cake!) and let the kids experience the aquatic theme first hand. Play pin-the-tail on the mermaid, and let kids decorate their own seahorses out of construction paper. 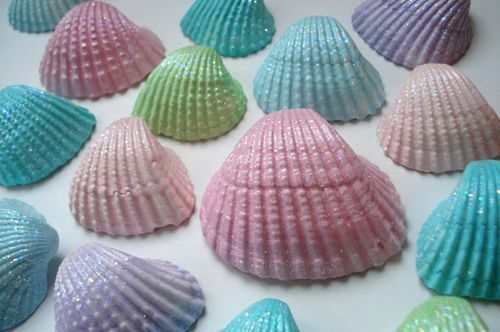 Or just put out watercolors and let kids paint shells. We like these pretty sparkly ones at Such Pretty Things (though they definitely aren’t watercolors). So many ideas to choose from with a theme like this. Gather ye landlubbers for the greatest pirate party in these waters. If you want to save a ton of time, check out the complete pirate party in a box from Parties by Alex, which makes it so easy to get everything you need. We’re talking pirate hats for all the guests, vests, eye patches, hooks (probably the reason pirates all wear eye patches), decorations, place settings, games, and loads more. The best part is that it’s fun for both boys and girls. If you’d rather DIY, you can go that route too. 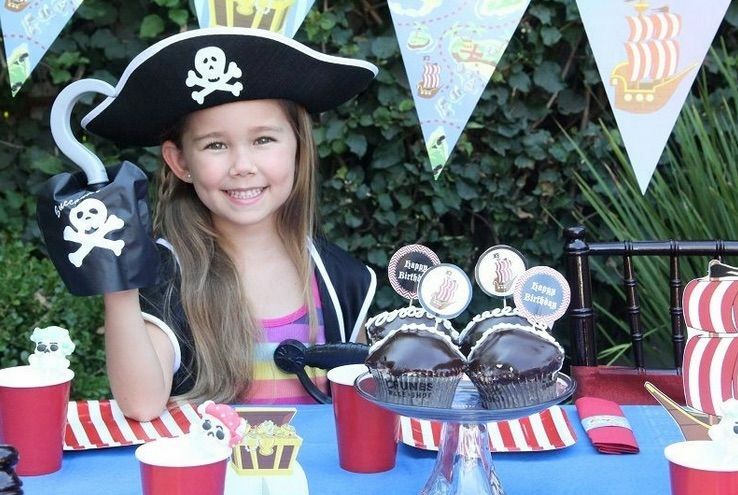 Our editor Christina threw a riotously fun pirate party for her little rapscallions using Paper and Cake’s printable pirate birthday party decorations. To keep her pirates from getting into too much trouble, she kept them running with a multi-stage scavenger hunt that had them swabbing the deck and digging for treasure. 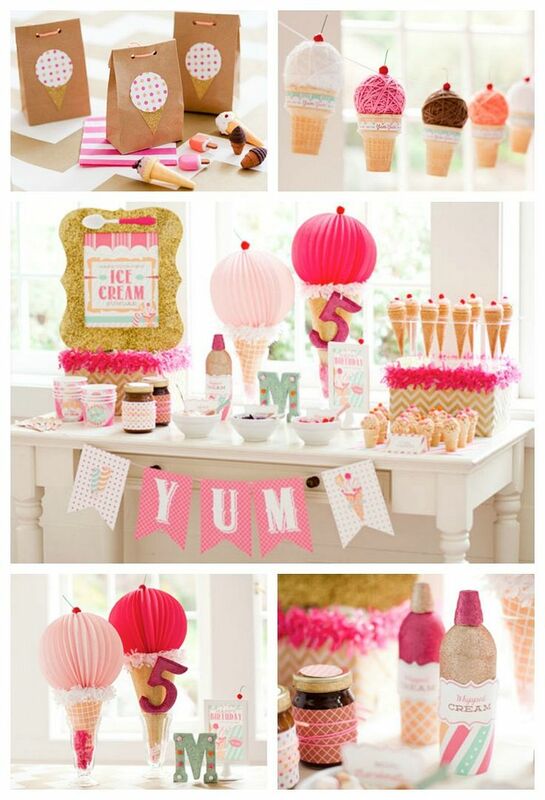 We know our kids will definitely scream for a party as cute and cool as this one by Hostess with the Mostess for PBK. You’ll find loads of free printables and tutorials for really creative DIY decorations, like the most adorable ice cream cone/yarn garlands. We also love her balloons which become ice cream cones with an added paper cone, and even the glittery whipped cream cans for topping off your ice cream cake yourself. (Kids always love that.) And of course, extra ice cream for the cake is a must, complete with a topping bar to let the guests do it up themselves. But it’s not all about ice cream; food can include snacks like popcorn or mini pretzel twists served in cones, or use those flat-bottom wafer cones for some healthy fruit salad. 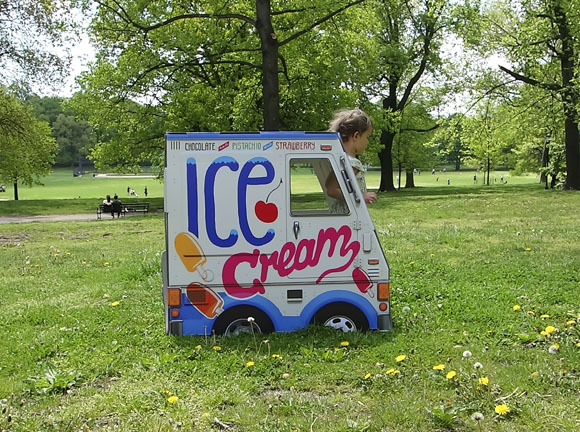 And, if you want the perfect birthday gift that will drive your child wild, check out the most adorable cardboard ice cream truck playhouse from Famous Oto. It works as outdoor summer party decor then turns into a favorite plaything for a long time. 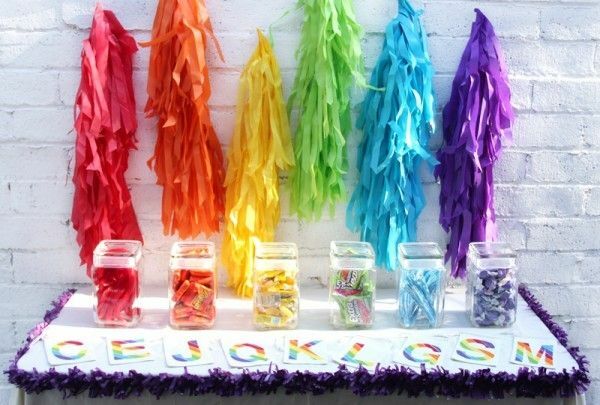 Combining some of our kids’ favorite things — rainbows and craft projects — we put together so many cool ideas for an outdoor rainbow art party which is a fun, vibrant party theme for a creative child’s birthday. From bright streamers (the photo above is from Studio DIY) to delicious rainbow-colored snacks, you’ll find a ton of rainbow party ideas. 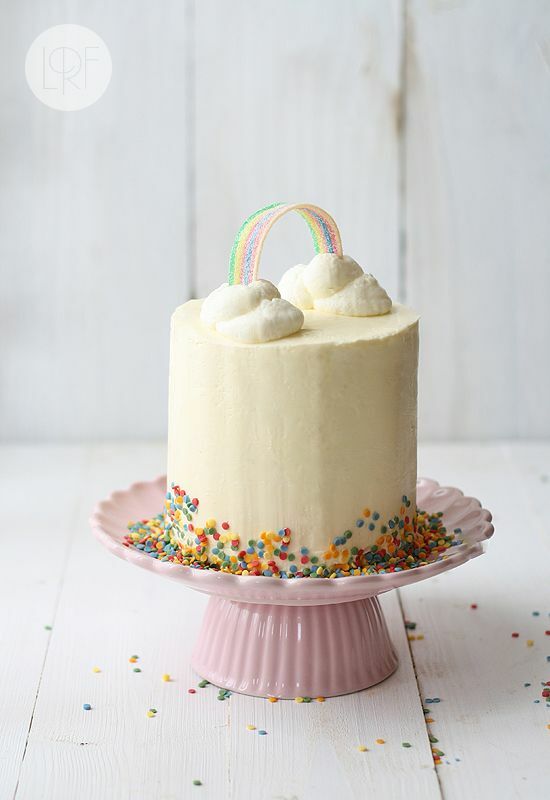 We also love this idea for a DIY rainbow cake topper from La Recita de la Felicidad that you can find in our post on decorating your own store-bought ice cream cakes. All it takes is one of those rainbow Airheads candy strips and a few other tips you’ll find on her site. Then keep the kids busy with fun rainbow themed activities we included on our post, like playing Pin the Cloud on the Rainbow, or getting all mixed up in a Rainbow Yarn Trail Game. Art projects can include creating unique abstract rainbow art, making rainbow sand art jars — or just put out some chalk and let the kids decorate your driveway or front walk in rainbow colors. It doesn’t always take a lot to please kids. Related: 20+ magical unicorn birthday party ideas that are truly one of a kind. Just like the birthday kid. If there are young kids who aren’t delighted by bubbles, we haven’t met them yet. Which is why we think a bubble-filled birthday would be totally over-the-top fun especially for a preschooler or kindergartener. Just supply plenty of bubble toys, as well as lots of “bubble juice” for refills, as you can find in this bubble-themed birthday party by Creative Vision Design and Photography where there’s plenty of inspiration. 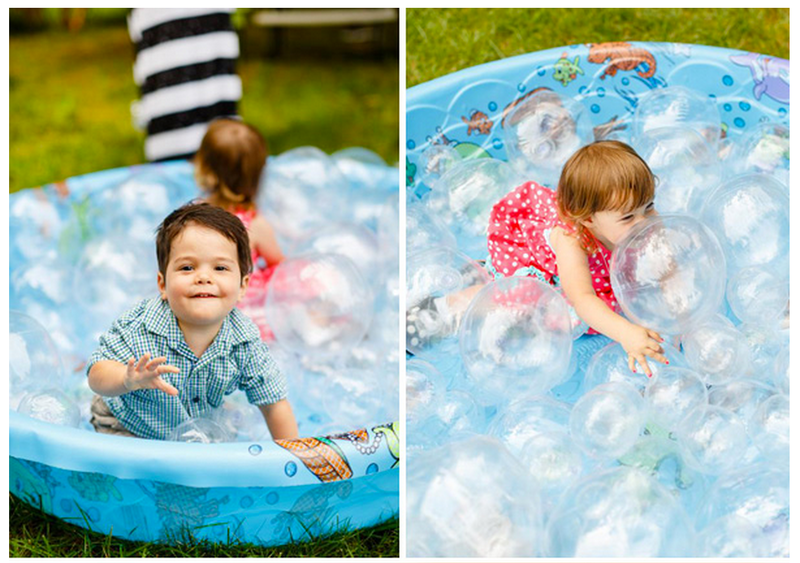 We also love the creative idea from Bellweather Events at HWTM in which she filled a kiddie pool with clear “bubbly” beach balls for some fun that’s decidedly less soapy. In fact, be sure to use clear balloons everywhere instead of colored ones. And of course, serve lots of bubbly for both the kids and adults. Well, bubbly ginger ale for the kids, we’d say. Cake Decorating Tip: You can add nearly any (clean, new!) items at all to top a Carvel ice cream cake, and make it extra cool and original without spending a fortune. For summer parties, think about beach toys, bubble wands, swim goggles, shells, or even just little balloons tied on top of skewers. 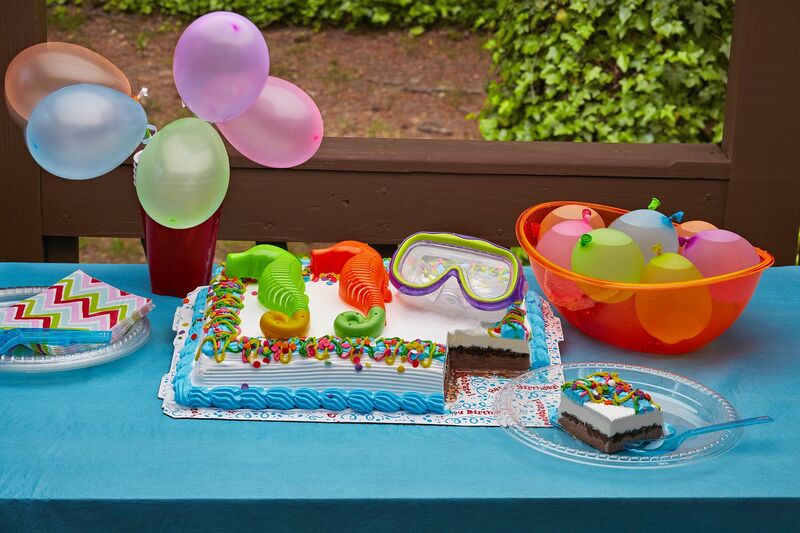 With everything in bloom, spring and summer are the perfect time to host a garden themed birthday party with lots of pretty floral decorations — or bugs and butterflies if that’s what your kids prefer. 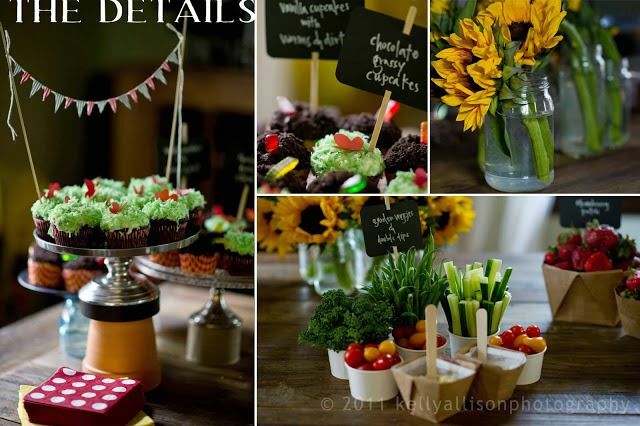 There are so many cool ideas from this party held by Kelly Allison. Serve delicious in-season garden veggies and veggie dip, and top cupcakes or (our pick) a Carvel ice cream cake with green grass topping and pretty butterflies poking out of the top. Plus use fresh cut flowers instead of store-bought decorations. 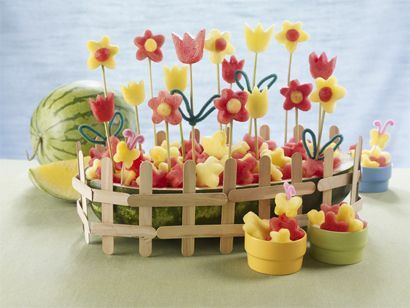 If you want to roll up your sleeves and grab a cookie cutter and some melon, we put together 11 impressive ways to serve a watermelon, like these cute melon flower skewers. Definitely grab a friend or partner to help you on this one, but the result is so amazing. Fun games for both boys and girls at a garden birthday party can include Pin the Ladybug on the Flower, or set up a craft table to let kids decorate and fill their own flowerpots to bring home. It would also be easy to create a scavenger hunt that sends kids on a trek to find plastic toy bugs hidden around the yard. Grass skirts, pineapples, and Hawaiian music: If you can’t be in Hawaii, bring it to your backyard for an afternoon luau. 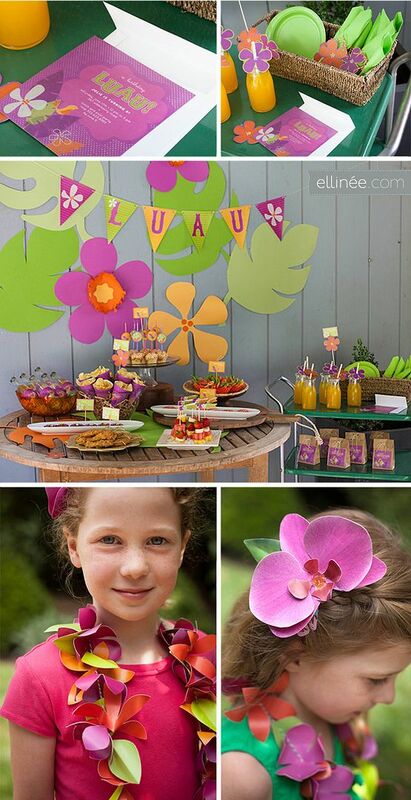 The set of luau party printables at Ellinée make turning a suburban backyard or apartment balcony into an island paradise a whole lot easier to do. For extra points, get some cheap hula skirts from a local party store and affix them to the edges of the table so they drape down off the sides. Of course you can also look for paper plates and cups with a fun, tropical motif like big flowers, pineapples or palm trees. Food is a snap with a theme like this — think fruit salad in carved out pineapples, skewered kabobs for something hearty. Fresh orchids are simple and perfect on the birthday cake. 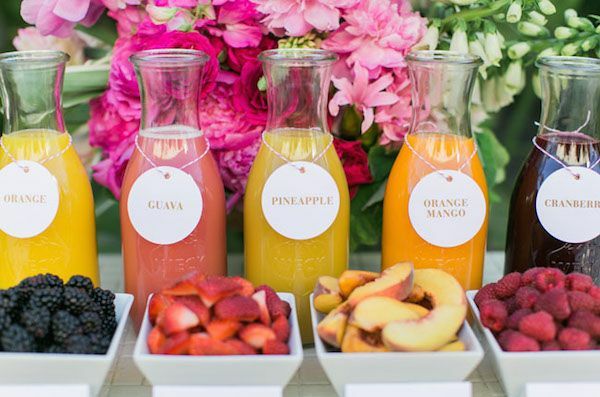 And we love the idea for setting up a fresh tropical fruit juice bar (with parasols in the cups perhaps? ), like this one from Green Wedding shoes. It was intended as a mimosa bar, but save that part for the adults. 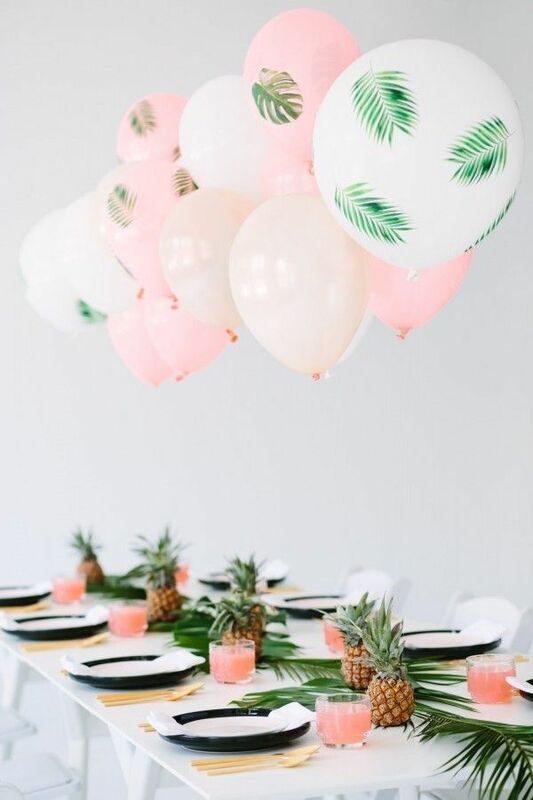 We also really like the sophisticated DIY tropical party ideas at Studio DIY (also featured at very top), like the fun palm frond balloons you can make yourself. Her ideas are proof that a luau theme can doesn’t have to be over-the-top campy, should you prefer a direction that might appeal to adults too. As for activities, keep your birthday guests busy seeing who can hula hoop for the longest amount of time, and then bring out the limbo stick to see how low they can go. When everyone needs to cool down — make some clever Tiki Puppets or flowery leis for everyone to wear home. And don’t forget kids’ sunglasses for the goodie bags! You can even have kids decorate their own with trim, rhinestones and glitter as a craft that becomes a party favor. Do you dare? Oh, we know a lot of kids who would nominate us for Parents of the Year if we let down our guard enough to throw a mud party. 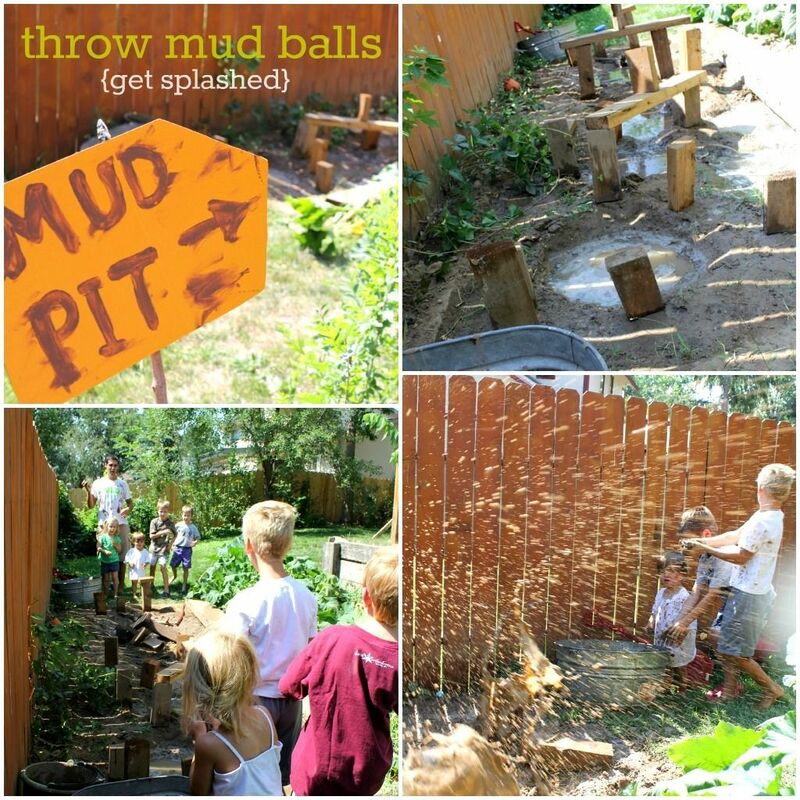 These mud party theme ideas we discovered from Meg and Andy are inspired. And yes, daring. Then again, it’s kind of simple — who needs tons of decorations when you just require a handmade sign directing kids to the mud pit? After mud play is over, hose everyone off for dessert — chocolate ice cream cake of course, maybe with some gummy worms on top — and some non-muddy water play. Party favors can include a clean towel and a bar of soap. Or alternatively, an apology note to the other parents. Then again, they’ll probably be thanking you for doing what they wouldn’t dream of doing! 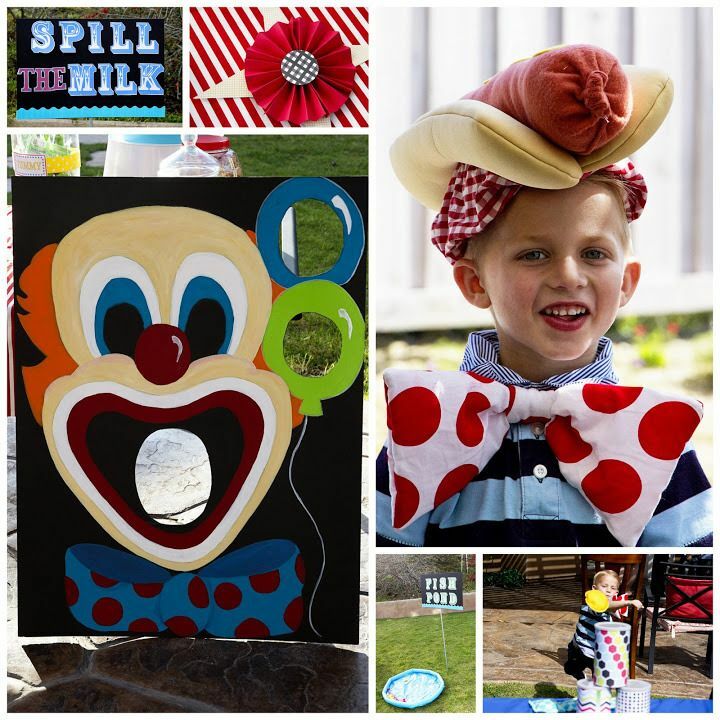 An outdoor carnival birthday party is such a classic theme and yet kids still love it. The best part is, it doesn’t have to be over-the-top elaborate to be fun. 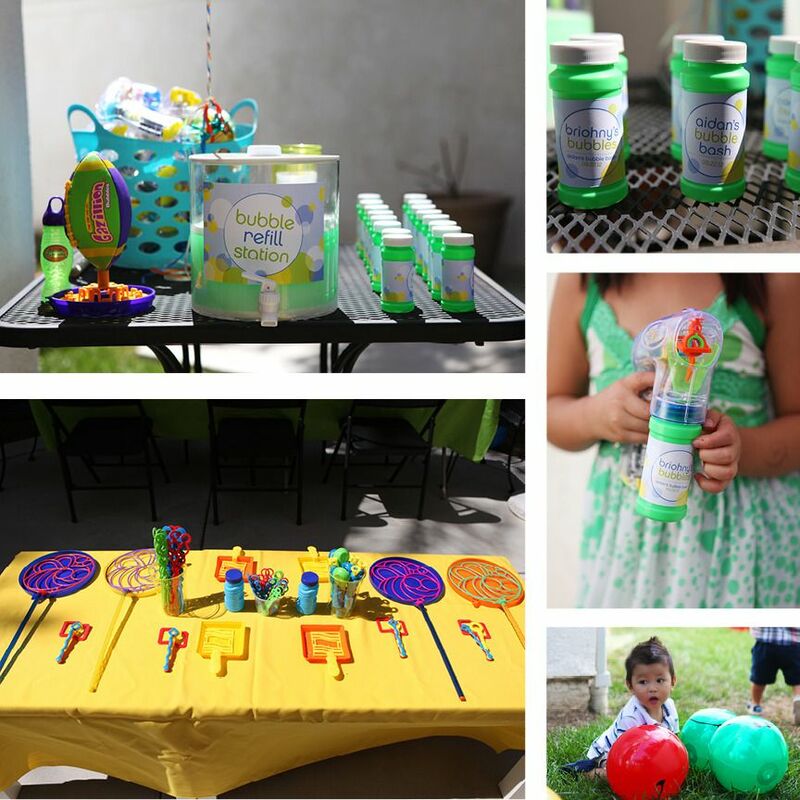 We love the ideas from Wait…Before I Forget which include an easy-to-make ring toss game, face painting, balloon animals, hot dogs, and on-demand popcorn for her son’s 5th birthday party. We’re also loving the suggestions for fun, easy carnival party games at Camp Fired Up, since renting a dunk tank isn’t usually in our party budget. In fact, she lays out every item and the total price, and it helps you realize just happy you can make your kids without spending a fortune. Since a party like this usually takes more planning and elbow grease, definitely buy a delicious ice cream cake from your grocer’s freezer then go to town with decorations yourself. 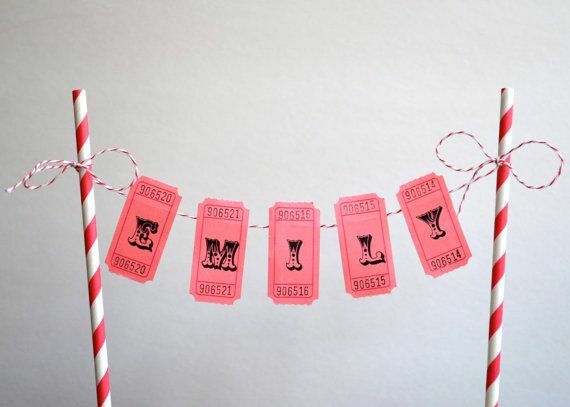 Top it with something fun like a little plastic toy ferris wheel, cute little plastic animal figurines from a party store, or isn’t this awesome: a personalized carnival cake bunting banner from House of Mark on Etsy, made with vintage looking tickets that spell out your child’s name. 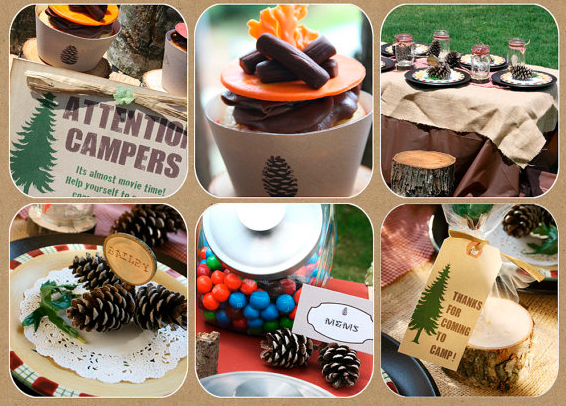 Summer is the perfect time to go to camp, even if it’s only for the afternoon, and we’ve got loads and loads of ideas in our post all about camp-themed party ideas. The rustic, printable party invitations shown here from Amanda’s Printables set the tone for a laid-back, old-fashioned-fun party. We’ve also got ideas for printable invitations, and a cool printable camping emblem placemat that lets kids design their own merit badges. As for activities, where do we start! Send kids out on a scavenger hunt, decorate pine cones, paint rocks, sing campfire songs, host a color war series of old-fashioned camp games like tug-of-war and three-legged races. You can end the day with a cool-down craft, like friendship bracelets or lanyards you make in the shade. Food can be as simple as hot dogs roasted over a fire, followed by a cake topped with crushed Oreo “soil” and gummy worms; or ring the sides with graham crackers, then smother the top with mini marshmallows and chocolate chips for a wildly easy s’mores inspired cake. Yum! Of course, you’ll have to send everyone home with a care package at the end. It is camp, after all. Thanks sooooo much to our awesome sponsor C​arvel ice cream cakes,​ for making it so easy to grab a great cake right from your grocer’s freezer while you’re shopping for party stuff anyway and cross one thing off your list. (Plus? Chocolate crunchies! The best!) Make sure to sign up for the Crunchie Club at ILoveIceCreamCakes.com and get a $5 coupon for your next purchase, plus more coupons on your family members’ birthdays, as well as special offers and discounts too. And be sure to visit our Ultimate Birthday Party Gift Guide for the coolest ideas for kids of all ages.